It's been just three days and Sadie, (aka Kyra), has made her way onto the sofa and into our hearts. She's adjusted beautifully to her new home with our boys and our Boxer, Luther. She's having no problems at all with crate training and house training. She is loving, smart, independent and inquisitive, and she snores like a seasoned professional! We're having loads of fun watching Sadie play with Luther and listening to the growly noises they make together. 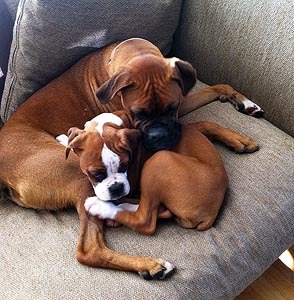 Two boxers ARE better than one! Thanks to you and SBPR for rescuing Sadie and allowing us to adopt her.